June 15, 2018 Geren W. Mortensen, Jr. It's appearing as though the time has come to replace my Casio Privia PX-310 stage piano. The reason has nothing to do with the sound, or the capability, or the playability, or the keyboard feel -- even though it is a touch mushy for my taste. The problem is that the audio jacks are going bad. They've given me some serious grief at rehearsals, and while they haven't caused trouble on a gig yet, it's probably only a matter of time. Bad audio jacks have been an issue with Casio keyboards for years, and as with others that I've looked at, the PX-310 appears to use purpose-made, plastic jack assemblies that are nigh on impossible to replace. Which is a shame, because Casio makes some really nice sounding keyboards, and this one is no exception. As some of you may remember, I'm a champion of the affordable keyboard. For 61-key instruments, I've often pushed hard to see what I could get for under $600-700, a ceiling I finally allowed myself to push through again when I bought the Roland VR-09 back in late 2015 (I've previously owned some really expensive keyboards!). Breaking that $700 budget turned out to be a godsend in the case of the VR-09, and so I've decided that I should have a reasonable expectation about the price of a weighted, 88-key instrument (despite the fact that I paid $599 for the PX-310 when I bought it a dozen years ago). This is going to cost some money. Street prices on today's models seem to start at about $500 reach almost $5,000. That's quite a range! So, in analyzing my needs (and desires), I've decided that I'd like to find something in the lower end of the range, with a street price from about $900 to $1,300. Within these models is an amazing range of capabilities. Some, like the Yamaha P-255, are pure stage pianos. Others, like the Roland Juno DS88, the Korg Kross models or the Casio, are all-out music workstations. The Kurzweils are interesting in their way. They're not quite stage pianos, not quite workstations, and not quite performance synths, but still manage to offer up some of the more important parts of each into really great-sounding and seemingly quite playable keyboard. I also need to make a comment about the original Korg Kross, which I blithely dismissed a couple years back. At that time, I wrote it off as a PS-60 redux based on it's outward appearance. Turns out, I was really wrong. It's still a pretty serious contender in the low-priced workstation space, although Korg's introduction of the Kross 2 late last year really upped the ante with modern controls and a slew of new features. With this vast range of capabilities within my target price range, I'm now having to think about what might I want in addition to pianos, electric pianos and strings -- which is what I use the Casio for now. For instance, the DS88 and the Kross 2 have sample playback capabilities, either from pads or keys. They even have the capability to support multi-sample playback, which allows turning almost any sound I can record into a pitched keyboard instrument. Being able to easily trigger background tracks at the touch of a pad makes songs like Pink Floyd's Young Lust or Blue Oyster Cult's Godzilla easy. If I want to do any loop or sample playback now, I have to use an outboard pedal, or the clunky playback engine in the VR-09. Almost all of the instruments in the list also have some level of arpeggiation, and some have the ability to use multiple, simultaneous arpeggiators. This makes it possible to do songs like The Who's Baba O'RileyI, or some of the more complex piano layers of Evanescence. ... but I'm not going to go through all of the features of all of these instruments -- I'd be here for weeks, and you'd all get really bored. Suffice it to say, I've got a lot to consider, not the least of which is where I'm going to buy the thing. At this point, I fully intend to return to my local music shop, Coffey Music, here in Westminster -- unless I decide I simply have to own something Bob can't get for me. I know I can get the DS88 there -- he's got one on the floor now. He's also got a Kross, but I'm not sure if it's the original Kross, or the Kross 2. Between the two Korgs, I would still want the newer model, despite the fact that the original model is a much more powerful instrument than I originally thought. At this point, it's a five-year-old model, and while it's still on a lot of store shelves, it no longer appears on Korg's web site. Yamaha MX88: I looked at the Yamaha MX-series synth when I was buying the VR-09. It's a fairly capable instrument with some nice sounds and a number of nice features, but at the time, I found it difficult to navigate. I'm pretty certain that's not changed any with the addition of more keys... In other words, the MX probably isn't going to make the short list. Again. Roland Juno DS88: Huge bang for the buck, and a familiar operating and playing environment, given that I have really grown to love the VR09 (yes, I know I was contemplating replacing it with the Nord Electro 5D61 not too long ago, but decided that the VR really does everything I need it to). I'm concerned that, despite the huge number of libraries available for the Juno and it's great Roland sound, it might sound too similar to the VR, and not really enhance the sonic palette any. And, it's heavy. At around 35 lbs, it's a good 8 lbs heavier than most of the rest of the models I'm looking at. I ain't getting any younger, and since I also carry the PA for the band, every ounce counts! Korg Kross 2: I've always had a love/hate relationship with Korg. My first digital synth was a Korg DS-8, and I've since had an X2 and the PS-60. With the exception of the DS-8, I've never felt really "at home" on a Korg. The Kross 2, however, seems to be much more intuitive than earlier Korgs. It's loaded for bear, has all of the features of the DS88 and then some, and only costs about $50 more. And, it weighs in at around 27lbs. Casio Privia Pro PX-560: I love the sounds in my current Casio. I love the simplicity of it. The PX-560 manages to keep most everything I like, add a lot more capability (though not as much as the Roland or Korg), while maintaining the Privia's svelte 26lb weight and size. And, it's got the really cool Hex Layer feature introduced in the XW-P1. The operating system is all touch-screen based, and it's really quite easy to get around -- easy enough that there's really no need for a computer-based editor. But, it's still a Casio, and I fear those plastic connectors I mentioned earlier. While I've had the PX-310 for a lot of years (10 or more), it's only seen a lot of road use in the past year or so, and like other Casios I've seen, they've deteriorated far too rapidly. Kurzweil PS6: This is the most expensive of the bunch under consideration, and it lacks a number of the features of the Juno and the Kross 2. But, it's a Kurzweil, dagnabbit! It's a real stage piano, plus some. The sounds are amazing. The editing and layering and splitting are incredibly flexible. The operation can be dead simple. It's got really high-quality balanced output connections. There's a real-time iPad editor for it (as well as PC and Mac software). It boots up in 11 seconds. It loads sounds from some of Kurzweil's higher-end models like the PC3 and Forte families. And yet, it's also surprisingly limited in some ways, like only having 5 favorites. But, it's a Kurzweil, dagnabbit! And it only weighs 27 lbs. Kurzweil SPS4-8: This is an interesting, slightly older instrument from Kurzweil. Like the Casio, it's got built-in speakers. By now, you can probably guess where I'm leaning. The Korg Kross 2 and the Roland DS88 are pretty solid contenders at the top of the list, and the Kurzweil is up there, too (I've always coveted a Kurzweil). Stay tuned. The final choice will be made in the next few weeks, as I'll be off to audition all of the contenders, wherever I can find them. [UPDATE 1 6/21/2018 Afternoon] - Decision is mostly made, after the Casio got really finicky at rehearsal last night. Even the slightest movement cause horrific crackling sounds from my amp, and also caused the sustain pedal to fail. Apparently, everything on the jack panel shares common grounding, or something. At any rate, the Juno DS88 is going to be my first choice, followed so closely by the Kross 2 that if I can get as good a deal on it as I've been offered on the DS88, I could be easily convinced to try the Korg. [UPDATE 2 6/21/2018 Evening] - I spent a pleasant hour at Coffey Music this evening. One of the DS88s they had in the store was sold. The remaining one is on layaway. There is at least one Kross 2 in the stock, and so I poked and prodded and played with it. I was very impressed with the sound and control options. In particular, just above the pitch and modulation wheels are two buttons that can be assigned to present alternate versions of the sound being played -- much like the "patch select" buttons on an Ensoniq VFXsd or SD1 (and other models)! That was a feature I found to be quite useful, especially when playing horns. Most of the sounds I played were excellent, and many, pianos in particular, bettered the Juno, as did the horns. I think Roland does a slightly better job of electric pianos and definitely does better with organs, but for organs, I have the VR09. All was not completely rosy with the Korg, though the issues I encountered were relatively minor. For instance, the pitch and modulation wheels are rather small and feel a little cheesy, but they're certainly functional. Realistically, I don't think I'll be using those controls a lot -- I don't even have them on the Casio. Certain other functions are in places I wouldn't necessarily expect, but I've always found that to be the case with Korgs. The one function I use all the time, key transpose, is not as badly hidden as I had thought. It's not something I'm going to be able to get to between songs, necessarily, but it is on a top-level menu. I can live with that. I also found the keybed is a little mushy, much like the Casio. I prefer a little crisper action, but it's certainly very playable. And, in fairness, the unit on display is set at an angle, not flat. I know that affects weighted-action keybeds, as it throws the balance of the mechanism off. Finally, the sampling function is not quite as robust as the Roland. While samples can be spread across the keyboard, the Kross doesn't allow for setting loop points. The whole sample can loop repeat, but it's not possible to loop the sustain portion of the envelope. Since the last time I had real, hardware sampler was when I briefly owned an Ensonig Mirage back in the early '90s, I doubt that I'll miss that feature. And, who knows. Korg could add the feature with a software update, as Roland did with the Juno DS. August 30, 2015 Geren W. Mortensen, Jr.
Every couple years, I take a look at the state of affordable keyboards, and lament that there's so little available. Well, not much has changed in that regard over the past couple of years. There was a brief glimmer of hope back in 2012, but since then, the field has all but depleted. Korg have discontinued both the X-50 and the PS-60, and Yamaha dropped the MM-6 and replaced it with the more expensive MX61. 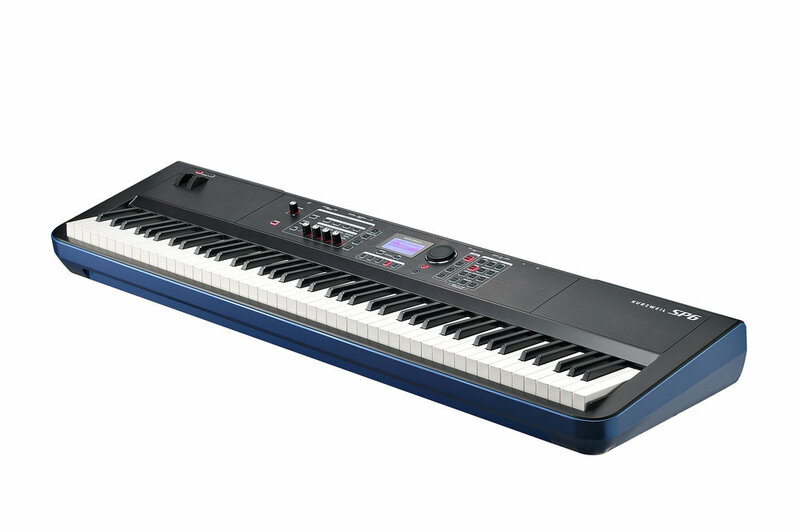 Casio's entries are still around, and Korg have replaced the PS-60 with something called Kross (61-key model). From what I can see and hear, the Kross is largely a re-hash of the PS-60, but with a less user-friendly front panel. Gone are the easy-to-use live performance modes (two-touch layers and splits, quick mixes of combi voices, etc. ), replaced by Korg's typically cryptic sequencer, moving it further into the realm of the "music workstation.," and further from a synth designed for live performance. By the way, if you are in the market for a well-priced music workstation that can go anywhere, I think this is a good choice, despite the cryptic sequencer and weak horn sounds. Casio's XW-P1 looked great on the surface (and it's a big surface) and the sounds are quite good. But as I investigated further, I again found that cutting costs have made for an instrument with some difficulties. The process of accessing many of the sounds is the same as on my Casio CTK-6000 -- press a category button and spin the dial to dig through a list of related sounds. And, I'm less than impressed with the build quality -- the instrument certainly does not feel very robust. And while I do take the CTK-6000 to practices and the occasional gig, I tend to wonder how long it will be before something on it breaks. Yamaha's MX61 is still a great-sounding keyboard, with a plethora of sounds from Yamaha's most excellent Motif sound engine. The keyboard has a good feel, and the controls for modifying sounds in realtime and creating splits and layers do fall conveniently to hand. But getting around, choosing sounds, etc., is a real pain for live performance. So, I may be slow, but I am beginning to notice a trend: low-priced keyboards properly designed and built for live performance really just don't exist. So what happens if the "price ceiling" is raised to, say, $900? Not a whole lot, really, except that one more performance synth pops up on the list of options -- Roland's V-Combo VR-09. And that's a kind of exciting thing, I think. The V-Combo VR-09 is the little cousin to the VR-700 and VR-760, which were absolute performance beasts. Roland appear to have done a bang-up job of condensing the V-Combo down to a lightweight 61-key instrument that is bred for performance. The top panel is arranged into a half-dozen zones, three of which dedicated to the different groups of sounds, labelled organ, piano, and synth. Additionally, there is a real-time effects section, a drum/percussion section, and the data-entry/editing section. Of particular note (no pun intended) is the organ section. There are modeled emulations of three different types of organs: "Jazz," "Rock," and "Transistor." The jazz and rock organs sound very much like Hammond tone wheels, while the transistor organ is very reminiscent of the Vox Continental. Customization of the tone wheel organs is really deep, and includes settings I've never seen on any emulator in the past. If you want to exactly imitate the sound of John Lord's B3 on Smoke on the Water, as recorded for the Live in Japan album, you could probably do it. One particularly interesting feature of the organ emulation is that, when in organ mode, the response of the keyboard is altered such that notes are triggered and released at the top of the key stroke, much like a real Hammond, whereas the other modes have a more familiar synth action. That's very cool for people who want to truly replicate organ playing, but are frustrated with other keyboards. Favorite combinations of sounds, effects, and other settings (including layers and splits) can be stored in one of 100 "registrations" for easy recall, which makes the now ubiquitous "peck and spin" tone selection much more bearable. From what I can tell, the lack of direct-entry for tone selection is the only real shortcoming of this synth. For those who want to dive into sound editing, there is a nifty iPad application that allows access to every parameter of the synth. In organ mode, the screen switches to a representation of the control panels on a tone wheel organ. I've spent a few hours listening to demos of the VR-09 (not just Roland or dealer demo recordings -- I wanted to hear it in the hands of "real" users). The sounds are mostly amazing, and run the gamut from the aforementioned modeled organs to multi-sampled pianos, electric pianos, and class to Roland's lush strings and brilliant horns. Everything a gigging keyboardist could want ... and more. There are many more beneficial features of the VR-09, and lots of great videos describing most of them on Roland's web site. Here's the direct link to the VR-09 on the Roland web site. February 19, 2012 Geren W. Mortensen, Jr. I'm always happy to be able to report that something that I've complained about has changed. A couple of years ago, I complained loudly that there were very few good, affordable (under $750) keyboards. At that time, there were only a couple of decent-sounding instruments out there -- Korg's X-50 and PS-60 (both of which I own), Roland's Juno-D, and Yamaha's MM-6. I'm happy to report that the market is responding! There are now at least 15 sub-$750 professional-level keyboards available from a variety of manufacturers, with two new models on the way from Casio. That's right, I said Casio. Casio brought out some of the first of the affordable synths and samplers (you can read an interesting history of Casio keyboards here and here), but with the exception of digital pianos, they've pretty much ignored the pro market until now. Casio will be releasing two exciting new instruments in the next couple of months -- a pro-performance-level model called the XW-P1 (slated to ship in March) and a loop and groove oriented model called the XW-G1 (arriving in April). MSRPs on these models are right around $700, with one dealer listing prices of under $500! While I need yet another keyboard like I need a hole in my head, the XW-P1 is on my short list for purchase later this year -- despite the fact that I just acquired a Casio CTK-6000 arranger keyboard. I'm really excited by the resurgence of lower-cost instruments in the market. There are a lot of us weekend-warrior musicians who just don't have the cash assets to plunk down a lot of money on equipment, but still need reasonable quality keyboards for our garage bands that only gig a couple times a month at best.